In any workshop you inevitably end up with a paint tin disposal problem. 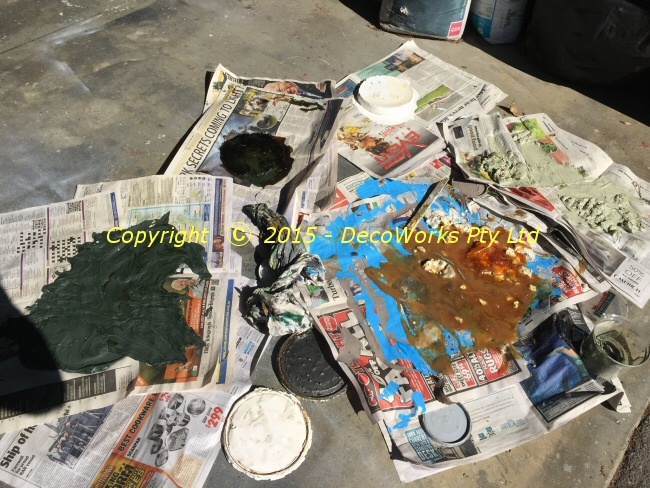 Any paint left over from projects is usually kept for possible use in the future which, over time, results in a large number of used paint tins accumulating in the paint cabinet. I recently embarked on a paint tin disposal program which involved checking each and every paint tin in the workshop to see if their contents were still usable. I was not surprised to find many had contents that had separated, skinned over or solidified into jelly. Some could be revived with some dedicated stirring while other tins had rusted bottoms and developed leaks when stirred. In all there were about a dozen or so tins that were beyond saving while the rest, after being stirred and date marked, were put back into the paint cabinet – for possible use in the future. Paint tin disposal is a messy business. Correct disposal involves emptying any leftover paint onto newspapers, letting it dry and then discarding the newspaper. 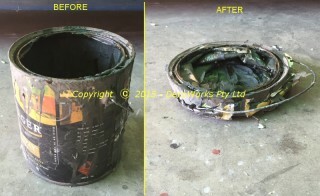 Before the tins are discarded they should be left open for a few days so any remaining paint can dry out. Garbage collectors are not impressed if two or three litres of Arctic Mint acrylic is released into their load and, more importantly, when it all ends up in a landfill paint tins eventually corrode letting their contents leech into the soil and contaminate the environment. 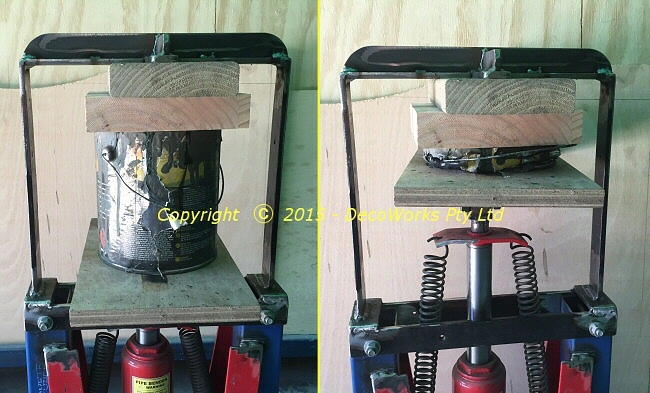 After following the correct procedure I was left with a dozen empty tins which could not fit into the rubbish bin. Since the majority of the volume of the tins was air I decided to flatten them. Now I guess I could have done this with a big hammer but I wanted to do it with a bit more style and finesse. 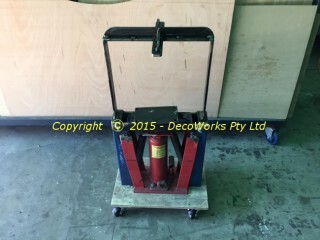 A steel frame was made up that bolted onto a modified 12 ton hydraulic pipe bender as shown above right. It only took ten minutes to crush all the tins into flat discs that made their disposal a breeze. It was also tons of fun. This entry was posted in Projects, Public Notices and tagged techniques, tips. Bookmark the permalink.